The most complex workings of the nervous system depend on messages sent through neurons. Together with their support cells, neuroglia, neurons make up all nervous system tissue. They receive and relay messages quickly, conducting them as electrical signals. Neurons release neurotransmitters, chemicals that jump the message to the next neuron or body cell. Specialized neurons in the spinal cord form neural tracts that speed messages to and from the brain. Read on to learn more about these “live-wire” cells. Structures of the nervous system, brain, spinal cord, peripheral nerves, and ganglia are formed from nervous tissue. At the cellular level, this tissue consists of neurons and neuroglia. Neurons are the message carriers. They transmit sensory signals and motor commands. 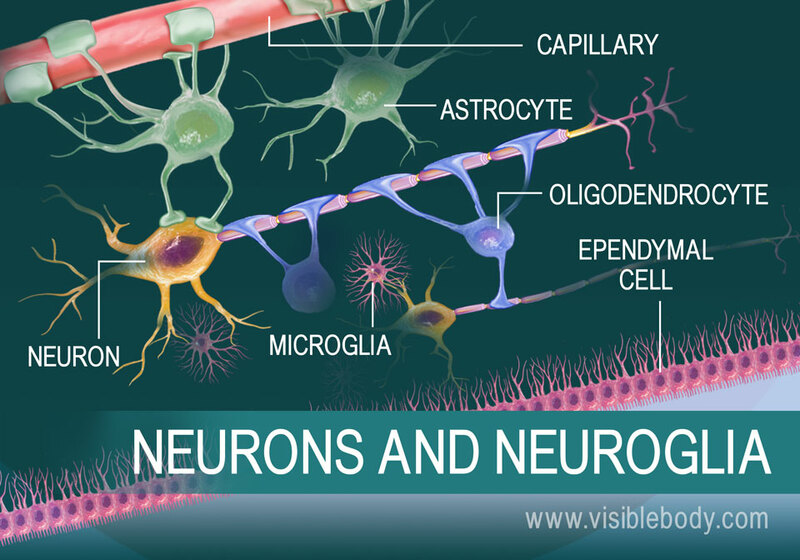 Neuroglia support the neurons and other structures that supply and surround nervous tissue. Astrocytes, the most common neuroglia in the brain, surround capillaries, maintain a barrier between the bloodstream and the neurons, and actively control what gets through that barrier. Other neuroglia, including microglia, ependymal cells, and oligodendrocytes, maintain neuronal homeostasis, remove pathogens, circulate cerebrospinal fluid, protect neurons, and affect their signaling speed. A typical neuron consists of a cell body, or soma, that has many branches called dendrites. 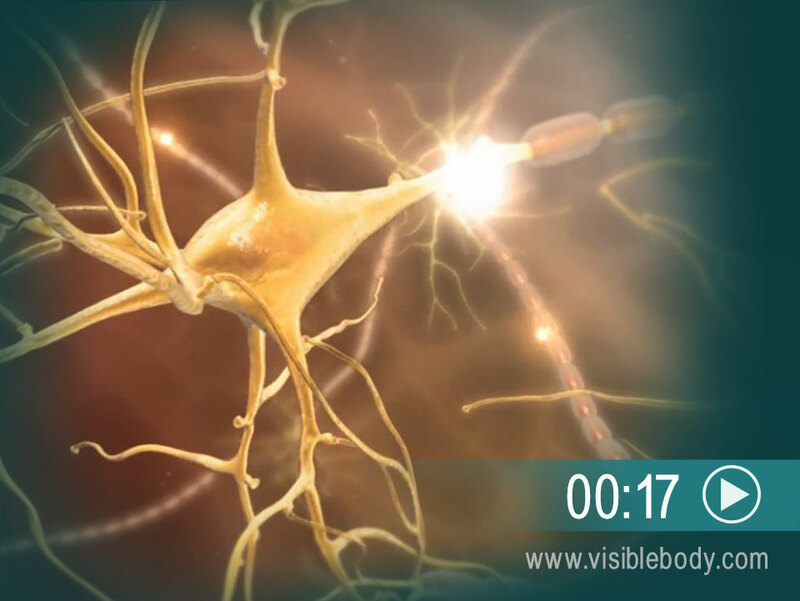 Signals received by the dendrites affect the electrical charge of the cell body, determining the likelihood of an action potential. If the soma is depolarized enough then the axon hillock region initiates an action potential that travels down the tail-like axon. Most axons are short but some can be as long as 3 feet. Myelin sheaths protect them and increase their conductivity, or signal speed. The electric signal zips down to the axon terminal. The terminal branches then release neurotransmitters, which have an excitatory or inhibitory effect on their target (other neurons, glands, organs). The long cylinder of the spinal cord consists mostly of bundles of axons that extend up and down to carry signals to or from the brain. 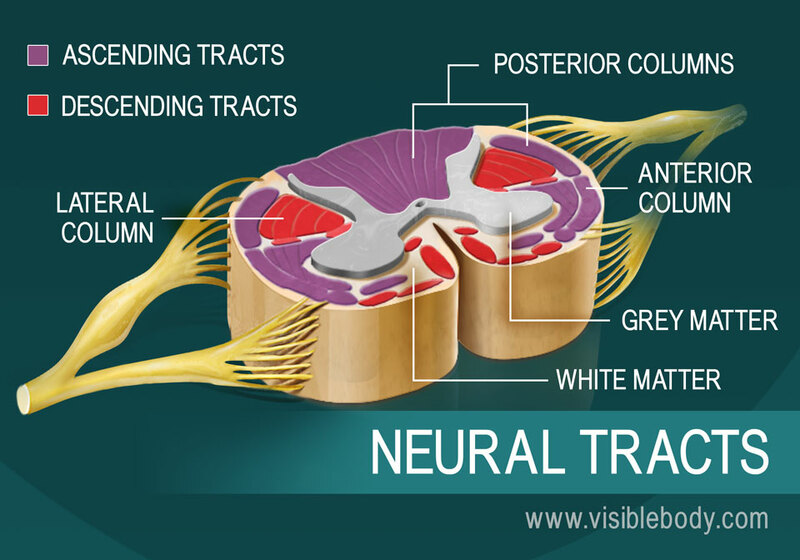 In a spinal cord cross-section, the axon pathways appear as “white matter” (myelin sheaths make the axons white) surrounding the “gray matter” of the neuron cell bodies. The white matter forms three columns (funiculi) on each side of the spinal cord: the posterior (dorsal), anterior (ventral), and lateral columns. Distinct neural tracts run through these three columns. 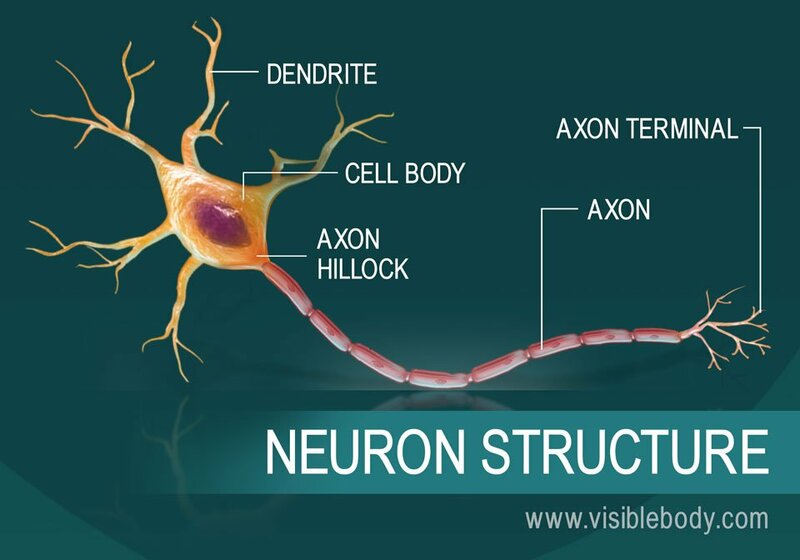 Each tract consists of axons that carry similar types of signals in the same direction. Ascending tracts carry sensory input upward to the brain. Descending tracts send motor commands downward to the body. When an electrical signal reaches the axons terminal of a neuron, it stimulates the release of special chemicals called neurotransmitters. 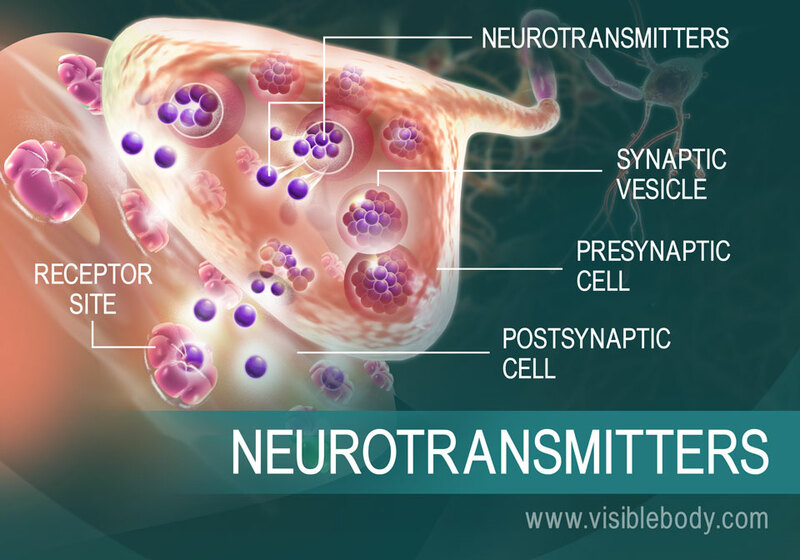 Neurotransmitters travel across synapses to the other neurons or to target cells, stimulating or inhibiting signals and responses. Acetylcholine, epinephrine and norepinephrine, and serotonin are among the most common neurotransmitters. Some neurotransmitters are more prominent in certain parts of the nervous system because they specialize in carrying messages within the brain, or between neurons and muscular tissue or other types of tissue. These chemicals are key to the nervous system’s regulation of body movement and internal functions. An article in Science Daily on a research study about the link between a neurotransmitter and alcohol dependence. An essay on microglia in Science Creative Quarterly.